Settlement: is a place where people live. A settlement may be as small as a single house in a remote area or as a large as a mega city (a city with over 10 million residents). Site: is the actual location of a settlement on the earth and is composed of the physical characteristics of the landscape specific to the area. Site factors include things like landforms (i.e. is the area protected by mountains or is there a natural harbor present? ), climate, vegetation types, availability of water, soil quality, minerals, and even wildlife. Situation: is defined as the location of a place relative to its surroundings and other places. Factors included in an area's situation include the accessibility of the location, the extent of a place's connections with another, and how close an area may be to raw materials if they are not located specifically on the site. Urban: The built up area, any city with a population of 10,000 people or more. Rural: Basically the countryside (everywhere outside urban areas). Rural areas maybe farmland, forest, desert or savanna depending on where you are in the world. Rural areas do contain small settlements of less than 10,000 people e.g. hamlets and villages. You will watch this YouTube once and then in groups you will try to summarise the key ideas in 1 minute. So, pay attention, make notes and prepare to explain what you have learnt. Using the YouTube and the information on the SCool Website complete the following worksheet. Settlements can develop in many different ways giving them a unique shape (morphology). Use the presentation below and make notes on the three different types of settlement pattern you can see. Then use the maps and satellite images to practice spotting them. Settlement hierarchy: is a way of arranging settlements into a hierarchy based upon their population or some other criteria. Hierarchy: Placing things in an order of importance. Services: Facilities that are offered to people e.g. supermarket, cinema, school or train station. Services have a threshold population, which helps explain why bigger settlements have more services. Threshold population: is the minimum number of people necessary before a particular good or service can be provided in an area. High Order Goods (Comparison): Goods that people buy less frequently. They tend to be more expensive and people will normally compare quality and price before purchasing e.g. a TV, car or holiday. Low Order Goods (Convenience): Goods that people buy every day. They don't usually cost much money and people would not normally travel far to buy them e.g. bread and milk. Larger settlements and conurbations have a much larger sphere of influence than smaller ones. This means they attract people from a wider area because of the facilities they offer. Cities such as London have a global sphere of influence, whereas a small hamlet or village may only have a sphere of influence of a couple of kilometres. Amount of people living in a settlement is not always a good way of determining the hierarchy of a settlement. Sometimes, the types of services that are found in a settlement can determine its hierarchy. Click on the link to examine the following services. Create a list of Low and High Order goods. Then examine what type of services each settlement type has. Which service is found where? This is related to the sphere of influence any settlement has. If you look at the diagrams you can see that a village will have a small sphere of influence and a city will have a large sphere of influence. Theoretically the services that are found in a city such as an international airport, government offices, etc need a threshold population to sustain them and so you can not have two cities inside the same sphere of influence. 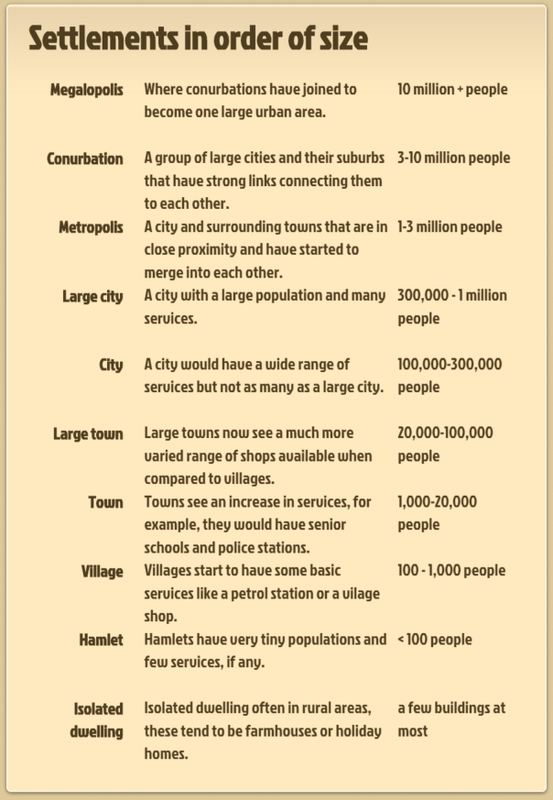 However, smaller settlements such as towns and villages only have services that require a smaller threshold population and therefore can be found in the sphere of influence of a city. 1 In which country Lozère is situated. 2 The largest settlement in Lozère. 3 The population of the largest settlement in Lozère. 4 When Lozère’s population reached a maximum. 5 Settlements that have a rail link. 6 Settlements that offer skiing. 7 Settlements that have the smallest range of services. 8 The distance someone from Mende must travel to go skiing. 9 The highest settlement in the region. 10 The name of the settlement which has a full range of services. Answer the questions on the PDF and the following questions. Looking at the map examine the factors that have contributed to the formation of settlements on the Isle of Wight. Very briefly explain the history of the Isle of Wight and its importance.